From LRPS to ARPS in just one year. In my twenties I was keen on photography but I never took it seriously and the only photos I took for many years were record shots of family and holidays. This all changed in the summer of 2016 when my husband and I visited the Canadian Rockies. I was blown away by their sheer beauty and started taking a lot of photos with my compact camera. Looking at the images I captured on that holiday, I decided that I would really like to take photography more seriously. I loved the idea of capturing a moment in time, a moment which I can return to for years to come. I was lucky to be given a Fuji XT-10 for my birthday that year and off I went. I started off as a landscape photographer who would routinely go out with a large rucksack and tripod in the hope of catching a blazing sunrise or sunset. However, I now prefer to head out with just my camera, taking photos of whatever I find interesting and appealing. Over the last two years my style of photography has continued to evolve and about a year ago I fell in love with monochrome. Not only do I love the beauty and pure simplicity of monochrome, but black and white photography allows me to express more creativity in the images I produce. Without the distractions of colour, there is more emphasis on shapes, texture, structure, light, shade, tones and composition. In this way I feel I am better able to convey mood and emotion, and there are always more things to discover hidden in the apparent simplicity of monochrome. Although I have a range of photographic equipment from lenses to filters, these days I generally go out with just my Fuji XT-20 on which I have my 18-55mm lens. If I want to shoot a long exposure or dabble with astrophotography then I will take my tripod but I much prefer the freedom of heading out with just my camera round my neck and a spare battery in my pocket! As for post-processing, I use Lightroom and a bit of Photoshop but my knowledge of Photoshop is very limited. Generally I aim to do as little post-processing as possible and the most I have ever done was for my ARPS panel. For me, the creative process is in capturing the image in camera and not in the manipulation of a captured image. For those who wish to see more of my images they can be found on the this web site here and on my own website here. At the top of the page is "Fisherman". This is an image of which I am particularly proud. 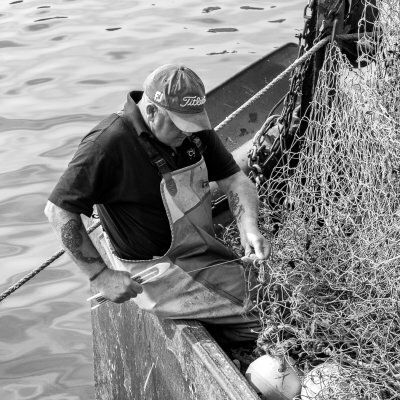 I am not at all comfortable taking images of people, especially if they are looking at me, but when I saw this fisherman mending a net I plucked up the courage to talk to him about what he was doing and asked him if I could take a few photos.